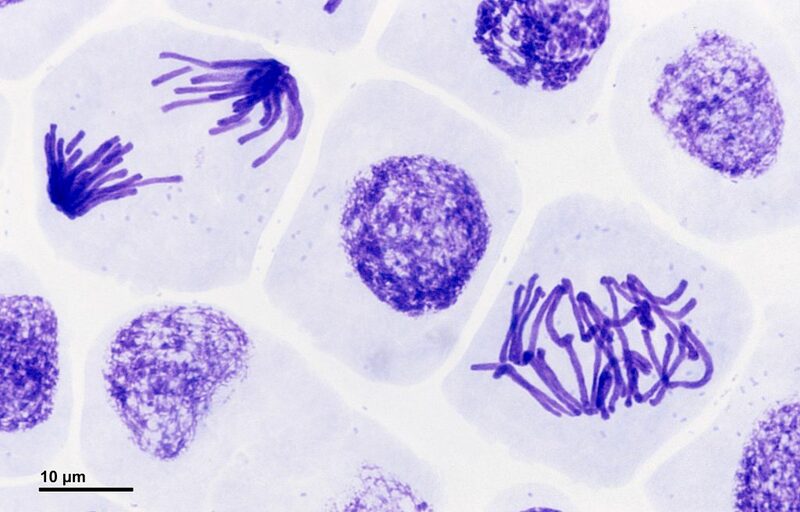 In this article, we will look at what mitosis is, the stages of mitosis and a clinical application of mitosis. Furthermore it will look into more detail into what is happening within the cell during each stage of mitosis. Mitosis is part of the cell cycle where one cell divides into two identical daughter cells. Both daughter cells will have the same number of chromosomes due to replication of DNA earlier in the cell cycle. Mitosis is a crucial process that happens in the body continually to replace damaged or dead cells. For example, the skin will entirely replace itself every 28 days. The dead and damaged cells will be lost from the skin, and replaced by cells created from mitosis. This is the first stage of mitosis. 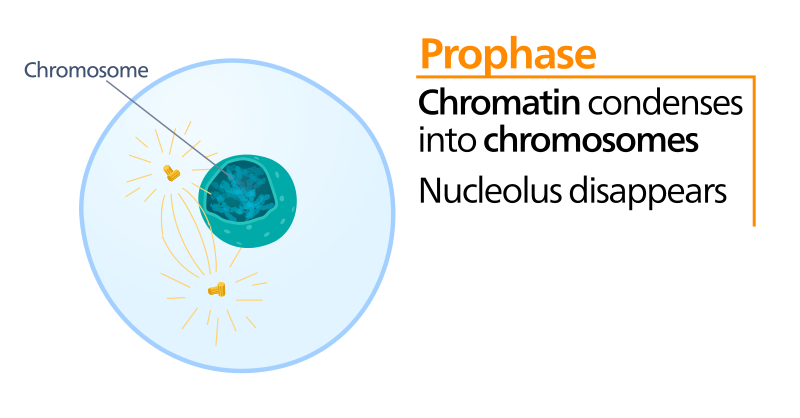 Firstly during prophase there is a process known as chromosome condensation. During DNA replication the genetic material is loosely packed as chromatin. For mitosis however, the DNA needs to be more tightly packed to allow for easier separation in anaphase. 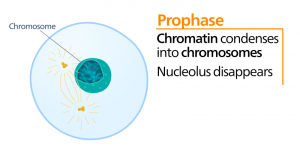 At the start of prophase, chromatin begins condensing into chromosomes. Each chromosome being made of two genetically identical chromatids, joined by a centromere. In addition, mitotic spindles begin to form. Mitotic spindles are structures made from microtubules that aid in the organisation and arrangement of chromosomes. The spindles originate from an organelle known as the centrosome. Each cell in mitosis has two centrosomes. 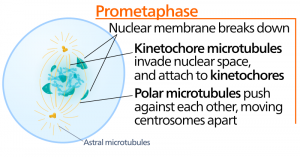 During prophase the centrosomes begin to move apart in opposite directions. In this stage the chromosomes finish condensing into their compact state. 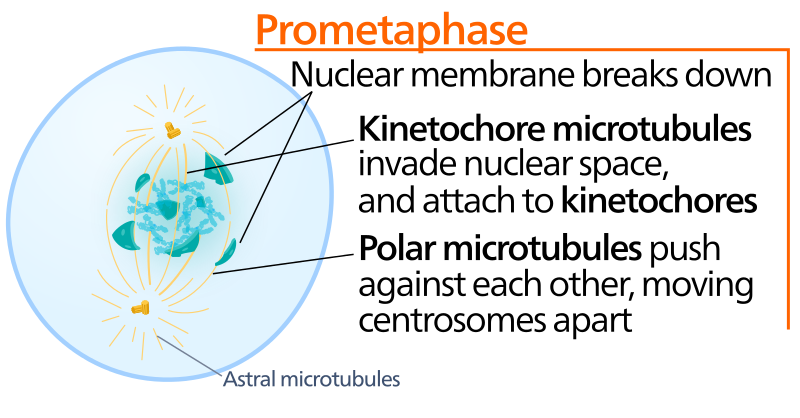 The nuclear envelope begins to breakdown, allowing the mitotic spindles to attach to the chromosomes. The mitotic spindles attach at a site called the kinetochore. The kinetochore is an area of the centromere on each sister chromatid. The sister chromatids are attached to spindles that originate from the opposite centrosome. 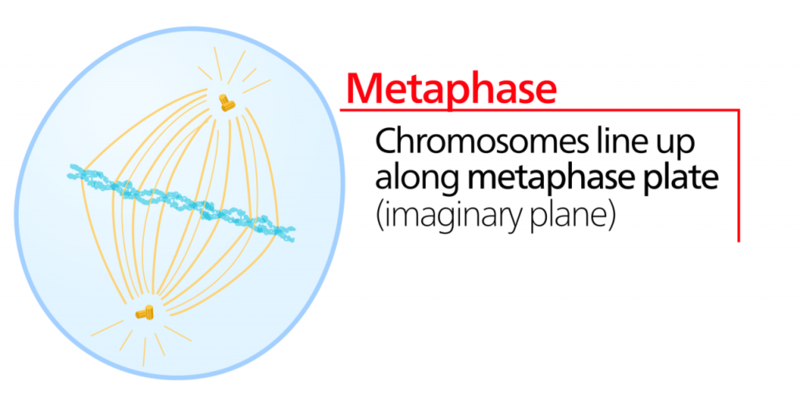 At this stage, the chromosomes align upon a theoretical line known as the metaphase plate. Furthermore the centrosomes have both now orientated themselves to opposite ends of the cell. Importantly at this stage the cell will check that all the chromosomes are aligned along the metaphase plate, with their kinetochores correctly attached. 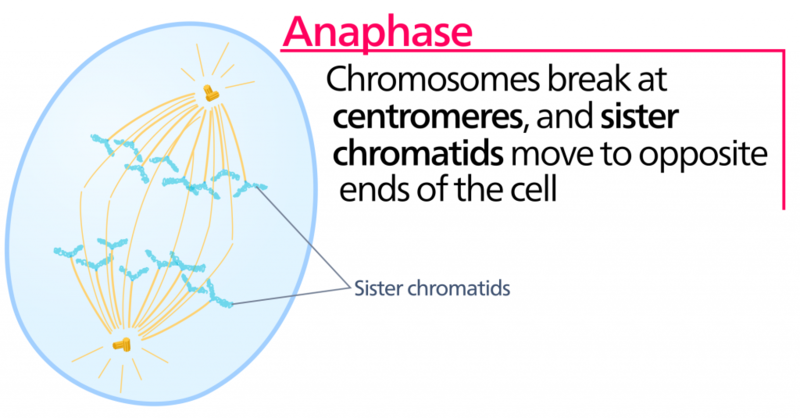 This helps to ensure sister chromatids are split evenly between the two daughter cells. An error in alignment or in a spindle attachment will result in the cell halting further progress until the problem is fixed. During this stage the sister chromatids are pulled to opposite ends of the cell. The spindle fibres decrease in length, breaking the chromatids at the centromere. To add to this spindle fibres not attached to chromatids will elongate the cell to prepare the cell for division. In this phase the cell has elongated and is nearly finished dividing. 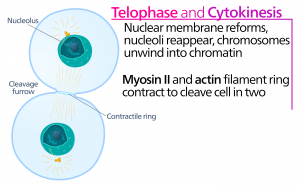 Cell-like features begin to reappear such as reformation of two nuclei (one for each cell). The chromosomes decondense and the mitotic spindles fibres are broken down. 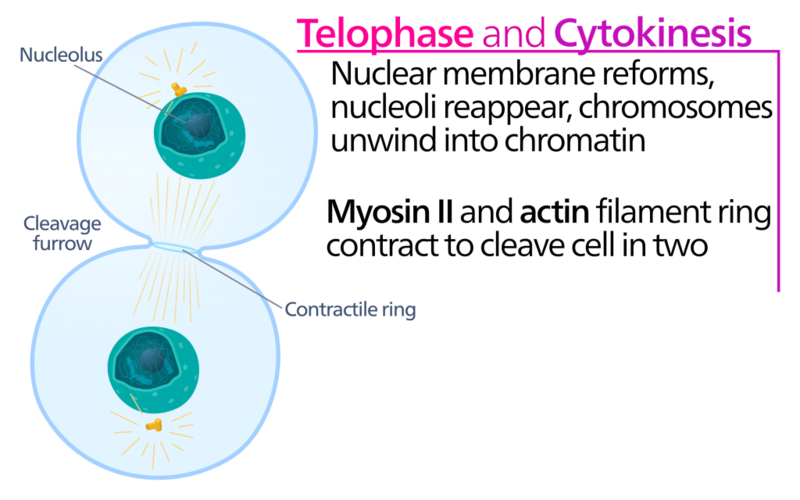 This is the division of the cytoplasm to form two new cells. This stage actually begins in either anaphase or telophase however it doesn’t finish until after telophase. To separate the two cells, a ring of protein (actin ring) pinches the cytoplasm along a crease (cleavage furrow). This splits the cytoplasm equally between the two cells. 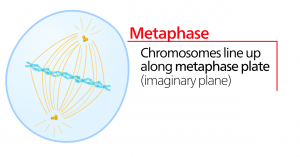 Errors in mitosis usually occur during metaphase. Usually this is due to misalignment along the metaphase plate or there is a failure of the mitotic spindles to attach to one of the kinetochores. This can result in the daughter cells having unequal distribution of chromosomes – a cell with one too many and a cell with one too few. The cell missing a chromosome usually dies however the cell with the extra chromosome can cause problems. If the extra chromosome carries genes that promote cell growth, this may lead to cancer. It is worthy to note the mechanism of cancer requires many conditions and the addition of an extra chromosome on its own would be insufficient to form cancer. Having an extra chromosome is not the most common cause of cancer, however it is a rare possibility. How often does the skin replace itself? During which stage does chromosome condensation occur? Which of the following does NOT occur in prometaphase? 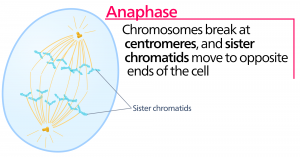 What primarily occurs during anaphase?